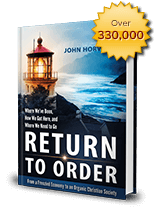 Return to Order promotes the timeless principles of Christian civilization that are wonderfully adapted to our human nature. Such principles produce an organic socio-economic order that is full of exuberant vitality and refreshing spontaneity. FREE Return to Order e-newsletter in your inbox every Wednesday at noon. We never share your email address ever. Thank you. What Does Saint Thomas Say About Immigration? Who Do Americans Trust the Most? © 2019 Return to Order. All Rights Reserved.